Dr. Bonnie Raphael from WCS is in EPRC! HomeDr. Bonnie Raphael from WCS is in EPRC! And Dr. Bonnie Raphael does not only stay at EPRC for 1 day, 1 week, but 3 MONTHS! She is a highly recognizable veterinarian with 20 years of experience with taking care of animals in WCS Wildlife Conservation Society. Despite her retirement last year, Bonnie came back to EPRC to care for the health of primates at our center. Our deepest appreciation goes to you, a kind and warm-hearted woman Bonnie Raphael. Since the day she arrived in the middle of August, she has been working tirelessly with some operations on primates at EPRC. 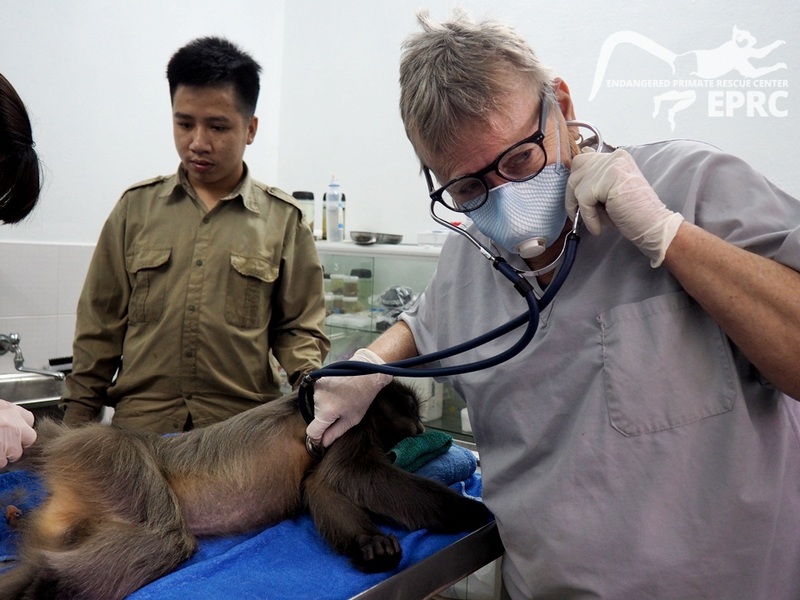 Below are some photos from a surgery for Noisy Chi – the Indochinese gray langur who had a tumor on her tail. Subscribe for our newsletter and Like our Facebook page to be updated on news at EPRC! We used anesthesia to put Noisy Chi to sleep and then moved her to the operation room. Dr. Bonnie Raphael put Noisy Chi in a proper resting position. … and then sanitized for the surgery. The tumor was cut off the tail. EPRC keepers stood around to learn and also to help Dr. Bonnie Raphael. It took a lot of time to sew the wound back because there is not much skin on the tail. The operation lasted 1 hours straight.